A quick, hassle-free way to stay on top of robotics news from the past month, our new monthly digest will be released on the first Monday of every month. 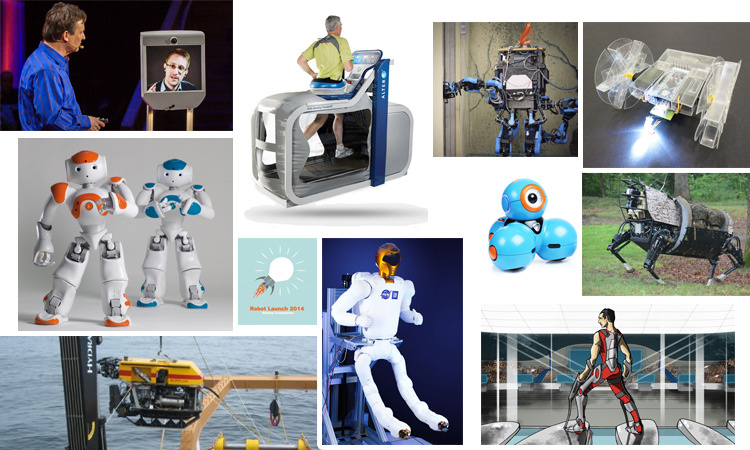 March 2014 was a contentious month for the robotics community. An intense debate about the commercialization of drones in the US was sparked (or re-ignited) after a US Court ruled against the Federal Aviation Administration in the case of a 29-year old Austrian who had been accused of operating a drone recklessly and without a license. With the FAA’s appeal, regulation of drones in the US is still a hot topic and will probably remain so for some time to come. Another hot topic was the state of AI, and whether artificial intelligence would overtake human thinking in the not-too-distant future. In an interview in the Observer, Ray Kurzweil suggested that robots will be smarter than humans by 2029. In response, Alan Winfield argued why they will not. Finally, we couldn’t talk about controversy without mentioning Edward Snowdon’s telepresence-supported appearance via BEAM at TED this month. While some of us at Robohub discussed how telepresence bots like BEAM can be used to disrupt borders, others questioned whether telepresence devices like the BEAM are even robots at all. Business news was good all-around in March, following the excellent industry outlook in February. This was demonstrated by various reports of expected growth in sectors such as remotely operated vehicles (ROVs) and rehab robots and exoskeletons. We also heard announcements of further investments in underwater drones by the Pentagon and news of the high number of Play-i pre-orders, which means the company now has an impressive $8 million in Series A financing. March also saw several stories about internet giant Google’s robotics related activities. This included a RoboHub interview with DARPA’s Gill Pratt on Google’s recent investments (part of our Big Deals series). The Verge then also picked up on the relationship between Google and DARPA, publishing a piece discussing Google’s rejection of military funding. Whatever Google’s long term decision on that front, DAPRA did announce that the SCHAFT team – recently acquired by Google – would be staying in the DARPA Robotics Competition. Finally, there was also a story confirming that Google’s Project Tango – a prototype smartphone – will be headed to space with the Orbital 2 mission scheduled for May this year. Staying with the space-theme, many robotics enthusiasts will have been pleased by the announcement that the popular ROS operating system is also headed for space, or more precisely, to the International Space Station, where it will support the Robonaut 2. Competitions were another hot topic this March. Round one of Robohub’s own Robot Launch 2014 startup competition closed with an impressive 57 entries from 19 different countries – stay tuned as we proceed to judging!! Also, the African Robotics Network (AFRON) announced the winners of its latest ultra-affordable robot competition (the print-and-fold robot from MIT took first place in the hardware category), and the Flying Donkey Challenge, which asked entrants to create a UVA to deliver items to remote locations, announced that it had 33 entrants for its first sub-challenge. Finally, inspired by the paralympic games in Sochi (Russia), March also saw the announcement of a new kind of sporting event: The Cybathlon, a championship for athletes using robotic assistive devices, is now scheduled to take place for the first time in October 2016. In other news, many roboticists will have been delighted to hear that the NAO Next Gen robot from Aldebaran Robotics is now sold to a wider audience from March 13th and will no longer be available only to academic researchers or hard-core developers – so if you’ve got the cash, you can now get a NAO Next Gen.
ROBOTS: From Imagination to Market – April 17 * Robohub Event! !